This page shows some of our customers reviews. All of these reviews have been submitted via email or websites such as Google Maps and Marktplaats. 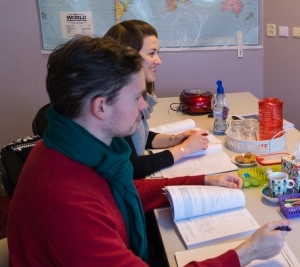 The reviews are written by students that have followed a language course at doeTAAL. About a few years ago, I decided to learn dutch and tried two courses. Unfortunately, there was no success and I found dutch is horrible difficult for me. Luckily when I was about to give up my dutch, I met doeTAAL. I like very much their good program and a small group study. Mrs Heleen is patient and very good teacher, and she guided me through all the very difficult grammers, speaking etc, and the most important of all, she stimulated me with new energy to progress my dutch. I don’t know how she did that, but I believed this is what good teacher for. I started learning Dutch 2 years ago before I came across Doetaal. It was very disappointing because it was a large group of people. I could only speak once or twice during the classes. Here, in Doetaal, lessons are for 2-4 people and that is why learning experience is totally customized to your level. I learned a lot in Doetaal in such a short amount of time. We have the chance to practice a lot during 2 hours of course weekly. Mrs. Heleen guides us perfectly with homework, speaking, teaching grammar, pronunciation and always very prompt to answer questions anytime. Many Thanks to Mrs. Heleen who kept my motivation high and made learning Dutch pleasurable! Contact doeTAAL directly by using our contact page!